Your parents wanted the best for you. They likely had visions of you moving away from home, setting up a wildly successful life, and still having enough money left over to take them on a beautiful tropical vacation during their golden years. To help you achieve all of that, they most likely shared their financial knowledge with you, teaching you what you should and shouldn’t do with your money. Some of the advice your parents gave you might have seemed right at the time, but you aren’t living in the same world they lived in. The financial landscape has changed, and so has the spectrum of good advice. 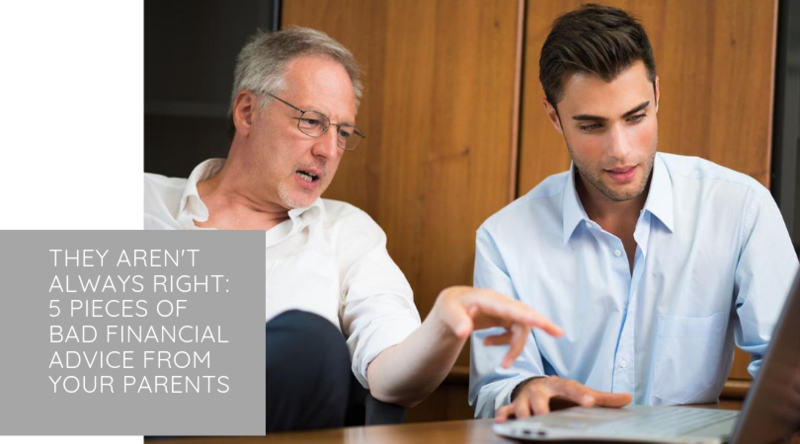 Though they meant well, you probably want to reconsider some of the money lessons your parents taught you. Your parents might have put a lot of fear into you about credit cards. They probably did it because they didn’t want to see you struggle with debt or see you tempted to make impulse purchases just because your card had a high limit. To a certain extent, this is good advice. Living off of credit cards and juggling a dozen lines of credit is a poor financial decision, but having no credit at all isn’t financially wise either. By choosing credit cards that offer excellent rewards or cash back and using them responsibly, you’ll see a wealth of benefits. As long as you continue to live within your budget, you’ll get the perks and you’ll have an excellent credit score. If you ever find yourself in a situation where you need to purchase a big ticket item, like a car, unexpectedly, your positive credit score will only help you. You might have heard that renting is the same as throwing your money away. You’re making payments to use something that you don’t get to keep. While it’s a great goal to save up for a dream house to settle down in someday, doing so right now may not be the best choice. Leasing or renting is helpful to money-conscious young people. Many of them won’t be living in the same place in ten years or driving the same car. When you lease an apartment or a car, a lot of the maintenance is covered. This reduces the number of unplanned expenses you might face. It also reduces commitment – if your life changes drastically a year from now, it’s easier to go with the flow. Savings accounts are great. They’re even better if they’re high yield. The only problem with savings accounts is that even accounts with the best rates aren’t going to grow dramatically. Keep some money in savings, but invest the rest. Investing your money will allow it to grow dramatically in a reasonable amount of time. The internet and apps have made investing easy. Read a lot, spend some time deciding, and invest from your couch when you’re ready. It’s nowhere near as difficult as it used to be, and the returns will rival any interest rate. The old way used to be to go to college, get a great job, and work your way up. That’s not how the world works anymore. Many people who attend school find it difficult to get a job in their field and wind up with massive amounts of debt that’s impossible to pay off without a career. University education is a noble pursuit, but it’s not the best pursuit for everyone. Learning a trade or a skill has the potential to be just as effective – particularly if it pertains to an industry that’s seeing a lot of growth. If the job you find yourself in isn’t paying you well or promoting you enough, don’t waste your time and efforts working there. Search for a better pursuit where you’ll be rewarded according to what you’re actually worth. A lot of old-school parents have a cash-only mentality. They stash it away beneath their mattress or spend money on things like gold. In truth, financial technology and oversight have grown to the point where this kind of skepticism is no longer necessary. If you’re suspicious of larger financial institutions, stick with smaller ones. Your money is going to be safer than your parents’ money ever was. Don’t let them scare you about banks and investments. Unlearning advice happens slowly for some. Your parents didn’t mean to mislead you or send you on the wrong financial path. Start by taking small steps to move in a more financially sound direction, and slowly but surely, you’ll find yourself on a more financially secure journey. With a background in Financial Management and over 7 years of experience in the personal finance field, Alana Downer is always there to help both individuals and businesses make smart financial decisions. Currently supporting Learn to Trade, experts in the field of investing and trading, Alana might often be found online, sharing her knowledge and tips with the money-conscious. Feel free to reach out to her on @alanadownerLTT.